There has been and will continue to be plenty of transfer activity at our local clubs during the summer months. We will keep you right up to date with all the comings and goings right up until the start of the new football season. 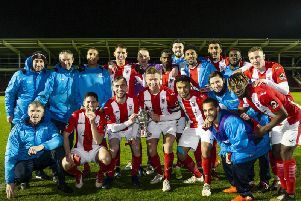 May 1: The Poppies released longest-serving player Brett Solkhon as well as Craig Westcarr and Chris Beardsley while a new deal was offered to Lee Harper. Kettering also took up an option on Andre Boucaud's contract to keep him at the A-Line Arena. May 6: Chris Doig, Leon Constantine, Colin Larkin and Greg Taylor were all released by Northampton Town. May 9: The Evening Telegraph revealed Diamonds midfielder Andy Burgess had been in Cyprus for talks about a possible move to Nea Salamis. May 12: Goalkeeper Chris Dunn signed a new two-year deal with the Cobblers. May 13: It was revealed that Chris Hope, Andy Burgess and Marcus Kelly are all on their way out of Rushden & Diamonds as they had all failed to agree new deals. May 14: Poppies chairman Imraan Ladak revealed he turned down offers for star players Gareth Seddon and Guy Branston. May 15: Assistant manager Adam Sinclair left Kettering Town but the Poppies confirmed they had agreed terms with youngsters James McPike, from Birmingham City, and Ryan Beswick, from Leicester City. May 19: Kurt Robinson joined earlier signing Nicky McNamara in completing a permanent move to Rushden & Diamonds. Robinson had been on loan at Nene Park from Ipswich Town towards the end of last season. May 21: Corby Town made their first move in the transfer market by signing Brett Solkhon following his release from Kettering Town. Seven other Steelmen players also committed their future to the club while another former Poppy Craig Westcarr sealed a move to Coca-Cola League Two side Notts County. May 22: Kettering Town revealed they are in advanced negotiations with a left-back, three midfielders and two strikers. Striker Daryl Clare completed a permanent move from Rushden & Diamonds to Mansfield Town on a one-year contract following a loan spell at the end of last season. May 23: Rushden & Diamonds captain Andy Burgess was linked with a move to Luton Town. May 26: The busiest day of the summer so far saw Andy Burgess and Marcus Kelly leave Rushden & Diamonds for Luton Town and Oxford United respectively. But Justin Edinburgh snapped up former Barnet midfielder Max Porter while Simon Downer also agreed terms for the new season. Elsewhere, striker Steve Guinan became Northampton Town's first new signing while Corby Town boss Graham Drury revealed frontmen Jason Lee, Steve Diggin and Leon Mettam were all staying at Rockingham Triangle. They will be joined by utility player Dave Deeney who joined from Hemel Hempstead Town. Former Diamonds and Poppies midfielder Gary Mills, meanwhile, signed for Mansfield Town while former Kettering striker Chris Beardsley joined Stevenage Borough. May 29: Corby Town announced that Mark Duckett and Dean Brennan have both left after agreeing deals with Nuneaton Town and Arlesey Town respectively. Northampton Town signed defender Craig Hinton on an initial one-year deal following his release from Bristol Rovers. Leicester City made Bristol City goalkeeper Chris Weale their fourth signing of the summer to join recent recruits Jack Hobbs, Wayne Brown and Robbie Neilson. May 30: Corby Town signed striker Lawrie Dudfield whose previous clubs include Kettering Rown, Leicester City and Northampton Town.